Here we offer you an extremely rare diver's watch - the Nivada Grenchen Depthomatic from 1964. It was the first mechanical watch with the built-in depth gauge. But how did a depth measurement work by means of this mechanical watch? There is a water tube around the watch glass. During the dive, the water enters the tube via a tiny hole at 3 o'clock. With increasing depth and thus increasing water pressure, the tube is meant to fill with water. To improve the readability, the color of water changes to a red hue. The red scale on the dial shows the depth up to 300 feet. 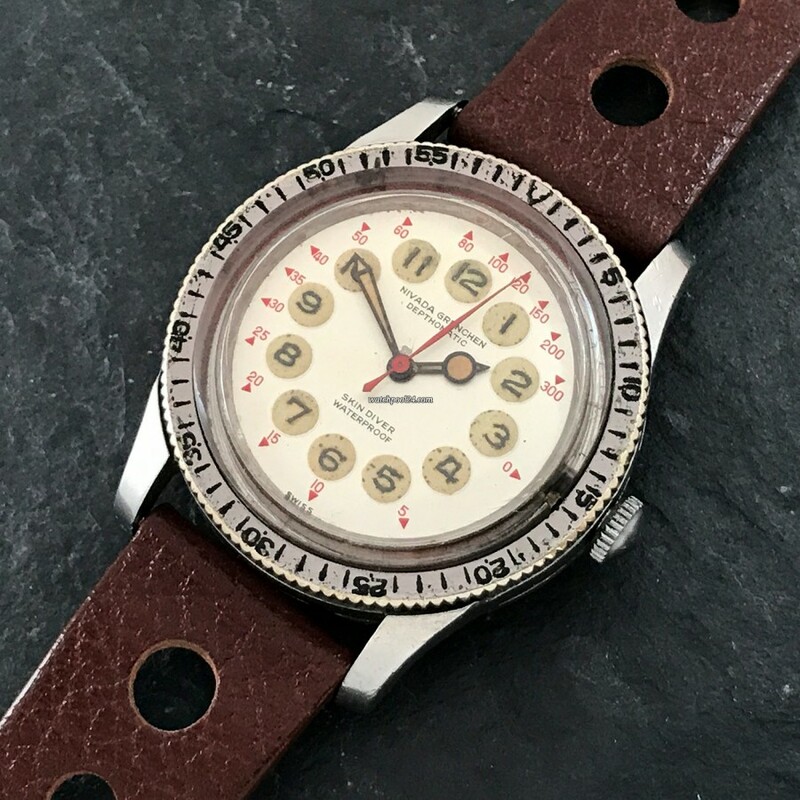 Of course you should not dive with this Vintage Depthomatic as it's not guaranteed that the watch is still waterproof today. On the pictures you can see the original advertising of the Depthomatic. This particular Nivada Depthomatic is in exceptional overall condition. Especially the Nivada diver's watches were really used under water back then. It is a wonder that some specimens have survived to this day. While most watches are only partially functional due to the high stress, this Depthomatic remained intact until today. The beautiful cream-colored dial is intact. The large 38mm stainless steel case has only natural traces of wear and looks absolutely authentic. This factor makes this watch extremely rare and special. The watch has a real vintage character due to the beautiful patina in the original radium luminescent material. The radium could be detected with a Geiger counter (see pictures), which also confirms the originality of this watch. The dial bears the inscription "Skin Diver" and "Waterproof" at 6 o'clock. The movement of this watch is the automatic caliber ETA 2451. The watch has been checked and is keeping time very well. This Nivada Grenchen Depthomatic is definitely one of the rarest vintage watches we have ever offered. If you are looking for something special, this vintage watch is certainly the right choice.